January 28, 2011 (San Diego’s East County) -- With my heart beating and my curiosity rising, I lifted off from Gillespie Field in El Cajon in a single engine Cessna with pilot Bill Howell. Nothing could have prepared me for what we are about to behold on a warm and gorgeous winter morning. 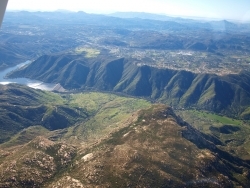 As we flew east toward the Cuyamaca Mountains, I sighted the beautiful blue water of Lake Jennings and wasin awe of its beauty. As I look to the east, I see the majestic El Cajon Mountain (El Capitan) which I have climbed before—and it’s breath-taking to see this glorious mountain from a different perspective. We circle this serene, beautiful place, savoring the pleasure. Farther east I am anticipating more of this serenity as I discover Cuyamaca Peak. The skies are so clear; it’s a picture perfect day. I relax a bit and enjoy just looking around at all this brilliant countryside. We fly onward to the township of Julian, a historical community which is home to many apple orchards. On our return flight, I wish that I could experience this on a daily routine. Bill names the places we are seeing on our return flight. 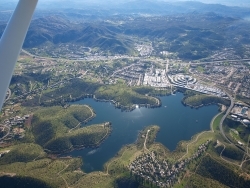 We fly over San Diego Estates, Ramona, Barona and Viejas reservations. We see the snow capped mountains of Big Bear to the north and canyons in East County below us are phenomenal sights. As we approach the captivating El Monte Valley followed by my hometown of Lakeside I hear the traffic controller and pilot Bill communicate as we prepare to land, and I am excited to hear this fascinating dialogue. Then we touched down, softly. I am saddened to have this wonderful adventure come to an end, but thrilled to have experienced seeing East County from a birds-eye view. The other side of flying high. I live in Blossom Valley and everyday there are 200 or more small pleasure craft planes flying overhead. This along with helicopters from the military, fire, police, and border patrol. Add the new flight path for jets from the airport and Mira Mars' jets and it's a rare 30 seconds of quiet around here. I can understand the beauty of seeing this great place overhead, but, don't love the sound of it.